C8, 6.2L, V8 Hybrid: 545 HP. Is This A ME Possibility? Buried in a Camaro forum, as per below, is GM asking Camaro owners how they would feel about two different motor possibilities, one of which was a 545 HP, 6.2L hybrid, V8. So if this were the the motor that we were to find in the 2020 ME, how would you feel about that being its power plant IF the exhaust sound were one you loved? This potential thesis fits with two independent rumors that while some have seen the mid engine, both reported that those who saw it were specifically excluded from seeing the motor itself. However, we have no verification that either reported sighting of the car actually happened, i.e., that both “reported sightings” could be either unsubtantiated or inaccurate rumors. Please note the comments attributed to Mark Reuss (bolded by the OP, but not bolded in the MotorAuthority article). GM patented a high-compression, twin-charged hybrid powertrain last October, and that could be a precursor to any sort of hybrid system the automaker has in the works. However, we wouldn't expect a Camaro hybrid with a V-8 engine to share many similarities with the rumored mid-engine C8 Corvette hybrid, especially since the Corvette's powertrain would be designed to fit in the middle of the car. Also in 2013, GM North America President said not to laugh off a hybrid Corvette, so it's easy to imagine a hybrid Camaro. Last edited by John; 10-23-2018, 12:03 AM. So basically the 545 Hybrid engine would pay for itself in fuel over the life of the car and add more punch. I would opt for that, however who knows what the longevity of the engine would be. I feel most wouldn't shell out the extra cash up front but would be paying for it in fuel over the long term. Whether most would shell out more would depend on what the alternative thereis (if there would be any), and what would be the power level of the entry motor. 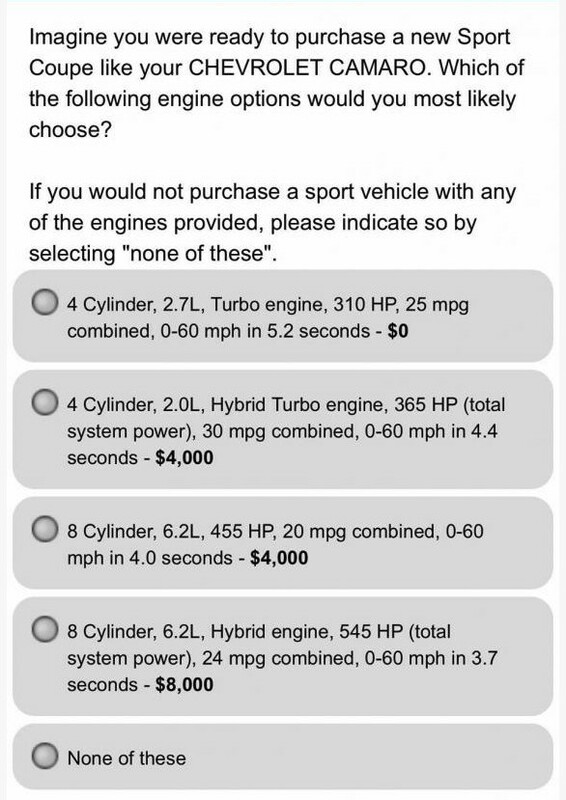 If the entry motor were 465 HP and the 545 hybrid would cost an extra $5,000, and if the hybrid would not have a significant weight penalty, then I would gladly come up with the $5,000 — assuming a torque advanatage somewhat comparative to the HP’s. As always, we do not yet have nearly enough info to make informed decisions. ****, reveal, hurry up and get here soon! The devils in the details from an added weight perspective and 8grand is too high for the hybrid technology. i wouldnt pay it if it added more than 100lbs. over time out of warranty i dislike over complication..
who knows maybe the price is less than 8 grand extra and the weight penalty is under 100 lbs. On Tuesday, we presented readers the idea of a 2.0-liter turbo-four hybrid engine or 2.7-liter turbo-four engine for a theoretical seventh-generation Chevrolet Camaro. Today, let’s talk V8 engines. All of this stems from a recent survey Chevrolet forwarded to Camaro owners asking for input on future powertrains for the sports car. In the survey, Chevy presented two V8 options: a 6.2-liter V8 engine making 455 horsepower (the same as the current 6.2-liter LT1 V8 engine) or a 6.2-liter V8 with a hybrid system that adds 90 hp for a total of 545 hp. The standard V8 would theoretically do 0-60 mph in 4.0 seconds and return 20 mpg combined, while the V8 hybrid would shave 0.3 seconds off the 0-60 time, but return substantially greater fuel economy at 24 mpg combined. Here’s the kicker, the regular V8 would cost $4,000 over whatever the baseline price is; the V8 hybrid would cost $8,000 more. Last edited by John; 10-23-2018, 02:17 PM. Reason: Fixed typo. I crunched a few numbers, to contrast the fuel economy numbers and dollars saved with the hybrid. So, don't hope that fuel economy will provide any meaningful payback on the upfront cost of the hybrid system. While I certainly don't mind hybrid tech, and I like the idea of an additional 90HP, the hybrid system is another potential area for future problems. Thanks Mobius, I completely agree with complicating things. I would only purchase a Naturally Aspirated Engine now that I think about. I have had problems with Twin Turbo's with under 10K on them and have also had a problem with Supercharger on Caddy's CTS-V just over 5 K on the clock (As Have Many Others) and was driven mostly gingerly. I will purchase a ME or 2 however plan on keeping them past warranty. A Proven Naturally Aspirated Engine which has endured the test of time is my choice. Last edited by Frenzy36; 10-23-2018, 02:24 PM. Interesting concept, but lots more for us to learn before I get remotely excited. Could turn out to be something; could welll however, turn to be absolutely nothing.